Tebing Keraton is one of the popular places for sunrise in Bandung. It is located about one hour away from Bandung city, uphill, near to Dago and Djuanda Forest Park (Taman Hutan Raya Ir. Juanda). When I went there for the first time, I was late and missed the moment I was aiming for. Then the next day, I went back again to the same spot with my friends, much earlier – we reached around 6.15 am, to catch the morning view from the top of the cliff. It is cold in the early morning but once the sun is up, the temperature is gradually going up, too. If you are thinking of the morning view with that egg yolk kind of sunrise, hold on, you will be disappointed for sure because you won’t get it in here. Instead, you will be offered a different kind of morning view and definitely, it is a beautiful one. The journey to Tebing Keraton may a little bit challenging for some people because of the access that is not fully ready yet for cars to go through. Fortunately, to get there by motorbikes is still possible. If we drive there, we can park our car at the nearest parking area and continue by foot. Alternatively, we can take a motor taxi or we call it ‘ojek’ locally, which is available near to the parking area. The distance from the parking area to the entrance is about 1.5 km uphill with few meters flat ground. In average, it takes about 30-45 minutes to reach. Enjoy the walk, as the view overlooking the villages and hills around along the way is quite scenic. We are almost there when we already see the village. I would say the most difficult part of the walk is the last slope which is short but it is almost 45º uphill. Sounds too much? As I said, enjoy the walk, we won’t get to do this often. Furthermore, when we see the group of cyclist cycling there, we will likely feel motivated. Because to cycle uphill is much more difficult than to walk. In fact, I heard Tebing Keraton was first found by a group of cyclists. Definitely, the morning view overlooking the pine forest. I went there several times and I noticed that the best timing to get the best view with all those clouds is between 6.30 am to 7 am. I love most when the sun is already up and the sun ray appears in between the trees. It feels magical. From the viewing point, we can hear the sound of the water flows from the river far below. Take sometimes to enjoy the sounds and the views. You will be glad you have made it here after all the efforts you put earlier. When Tebing Keraton was first known by the public, it was still left at it is in the beginning. No pavement yet from the entrance to the cliff and the soil ground is slippery sometimes in the morning. Not even a single barrier found around the cliff. So, if we are not careful, we can say bye to the world. But if we go there now, we can see Tebing Keraton is already quite well-managed. There is a ticket counter at the entrance, restrooms, and there is proper pavement to walk around the park including to the cliff. We can also see wooden barrier has been built around the cliff viewing point although I can still see “naughty” visitors that climb over it just for the sake of photo-taking. Then, if we walk further in, we can find a viewing tower and camping ground for those who want to camp overnight. For eateries, it is still limited to simple ‘warung’ selling quick meals to fill our tummy before going off. You may wonder why the place is called Tebing Keraton or the Cliff of a Royal Palace? Well, from what I heard, some say that the locals got a vision that they saw a palace on the cliff while some say that the locals had a dream and they were told to name the place so. There are many versions of rumours going around. 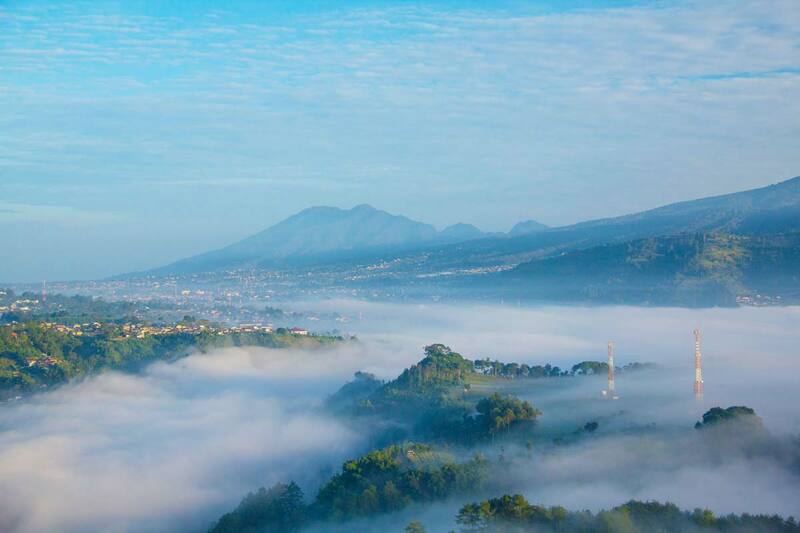 No matter what it is, Tebing Keraton has to be on your bucket list when you go to Bandung. Lastly, don’t thrash your Tebing Keraton entrance ticket because you can use it to get free entry to Taman Hutan Raya Ir. Juanda as well which is located just a stone’s throw away. Actually, it is not free but rather it is included already. Have you been to Tebing Keraton? Don’t you think the view is dreamy? Or you would prefer to enjoy the morning view with egg yolk sunrise? Tell us in the comment box below.